The Canon EOS 30D is an 8.2-megapixel semi-professional digital single-lens reflex camera, initially announced on February 20, 2006. It is the successor of the Canon EOS 20D, and is succeeded by the EOS 40D. Changes over the 20D include a bigger 2.5-inch LCD rear screen, improved shutter mechanism rated for 100,000 actuations, improved frame capacity, 1/3 stop increments for sensor speed and an added spot meter. The camera retains the same sensor as its predecessor; all lenses still have an angle of view crop of 1.6. Other changes include a larger 11 frame RAW / 30 frame JPEG buffer, and slightly faster 0.15 second startup. The maximum frame rate is the same (5 fps), but a lower-speed 3 fps option has been added. The 30D uses the same number of autofocus points as the 20D (nine), but has improved algorithms. The 30D can record in both JPEG and RAW .CR2 files. The camera shows the ISO in the view finder while changing the ISO. The EOS 30D can also accept the Canon Wireless File Transmitter WFT-E1/E1A for fast file transfer to a remote file server, either through an ethernet cable or a Wi-Fi network. This capability expands the EOS 30D’s range of applications to sports and studio set ups where real-time transfer of the images is crucial. Compare it to the competition and it’s clear that the 30D really can hold its own. The primary competition coming from Nikon’s excellent D200, a camera which in many ways betters the EOS 30D, user interface, features and flexibility are all a step up. 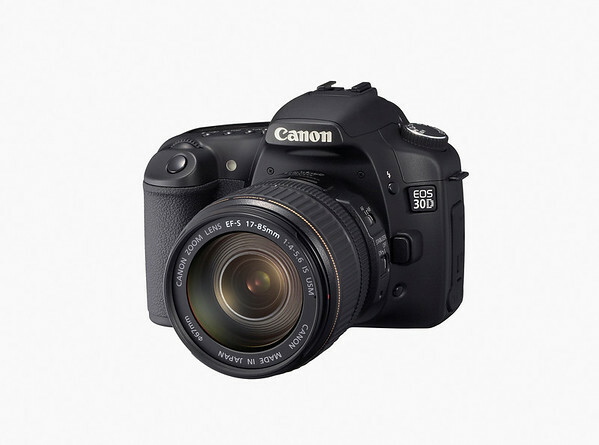 The Canon EOS-30D is an excellent midrange digital SLR. While its new features aren’t exciting enough to get this 20D owner to run out and upgrade, those who are moving up from point-and-shoot or entry-level D-SLRs should definitely give the 30D a look. Overall I think the EOS 30D is a great camera and I’d have no hesitation at all in recommending it to any serious photographer. There’s no other word for it, the Canon 30D’s images made just fantastic looking prints, with excellent detail and sharpness at 13×19 inches. Even though the Canon 30D may not exactly be a revolutionary digital SLR camera, and the expectations were somewhat subdued, it is still a truly fantastic camera. The concept was already solid as could be, but with the introduction of the Canon EOS 30D, Canon have once again clearly asserted and strengthened its roots and their position. With a SanDisk Extreme CompactFlash card in a 30D, we were able to fire off as many as 46 highest-quality JPEGs at 5 fps, and continued shooting at 1 fps or faster until the card yelled “Uncle!” That’s impressive. (With the same card in a 20D, we got 32 JPEGs at 5 fps.) The 30D’s burst rate for RAW capture isn’t quite as dramatic—Canon states 11 frames at 5 fps, and we could sometimes shoot 12 with a fast card—but the speed is still way ahead of other cameras in this class. The 8-megapixel Canon EOS 30D should be on your short list for a semipro dSLR camera. If you’re buying online, I recommend sticking with Amazon, B&H Photo or Adorama. These three vendors are reliable, trustworthy and generally have the best (legitimate) prices. Additionally, purchasing your camera through these links helps support this site.